This price only includes the projector. No screen. For a screen, please enquire. This chic and modern space in Dusseldorf is ideal for you if you rent a meeting room and want to brainstorm in small groups. The cozy room allows up to four people to let their mind wander and to initiate creative processes away from the everyday environment. The cozy armchairs make the ambience of the room look very noble and lead to meetings here can be optimally performed. 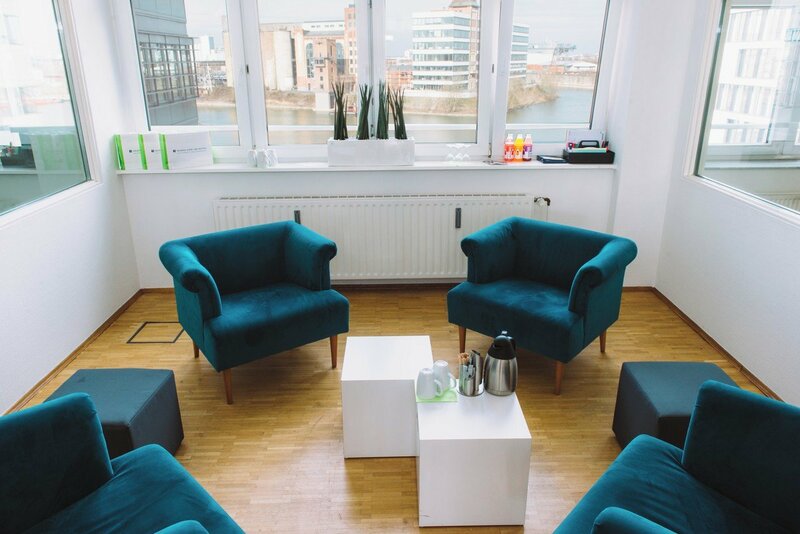 Book the meeting room near the Dusseldorf port, is also therefore practical, as well as external employees can reach them quickly through the central location. Renting meeting rooms, for example, this cozy and light-flooded room, offers you and your employees a high level of comfort and new perspectives in everyday working life. Renting this meeting room in Dusseldorf is a great option for start-up companies that do not yet have their own prestigious rooms. Here it is possible to receive business partners or to meet with the individual employees. Even established companies can book a meeting room and receive guests in a central location or conduct their own team meetings. Renting a meeting room at the Dusseldorf harbor offers you and your employees a number of advantages. During a break you can enjoy the view over the harbor and also over the Rhine. In addition, it is possible to quickly reach attractive restaurants and cafes in a picturesque location and to strengthen themselves here during the breaks. Also, the journey by public transport is easily possible, because the S-Bahn stations Dusseldorf-Hamm and Dusseldorf Völklinger Straße are within walking distance. The Bürgerpark and the Rheinpark Bilk invite to explore after the meeting. If you rent this meeting room in Dusseldorf, you and your colleagues can also combine the work with pleasure and pay a visit to the Königsallee and the Dusseldorf Old Town.